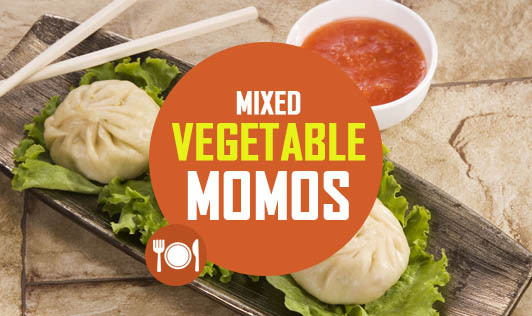 Mixed vegetable momos are undoubtedly an innovative, low calorie snack! • Sieve maida and salt together. • Add warm water bit by bit and knead well to form soft dough. Keep aside for half an hour. • Keep the dough covered with a damp muslin cloth. • Divide the dough into eight equal parts. • Roll the dough into 3" diameter circle to make the covering. • Heat one tsp of oil in a pan. • Add garlic and ginger and sauté for a few minutes. • Add all the vegetables, sugar and salt to taste and mix well. • Switch off the gas and keep aside. • Put 2 tsp of stuffing in the center. • Apply the flour paste on the sides of the covering. • Now fold over the covering to form a semi-circle. • Pinch at the edges to keep the stuffing sealed. • Steam them in a steamer for ten minutes. • Serve hot with schezwan sauce. • To make them protein rich, stuff them with paneer, tofu or chicken.